Editor/Author Spark, Arlene, Dinour, Lauren M. and Obenchain, Janel, et.al. This second edition of a bestseller, Nutrition in Public Health: Principles, Policies, and Practice focuses on the role of the federal government in determining nutrition policy and influencing practice. 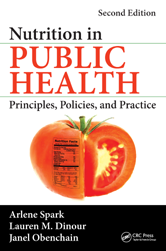 Beginning with an overview of public health principles, the book examines the application of nutritional policy to dietary guidance, health promotion, and the practice of public health nutrition. Chapter 2 - Preventing Disease or Promoting Health? WOULD A HEALTH PROMOTION MODEL NEGLECT THE REALITY OF DISEASE?